I arrived in Alicante planning to stay just a few months, thinking I’d wait out Spain’s scorching summer months here beside the city’s languorous stretch of Mediterranean coastline, a chance to relax and recharge before returning to a larger city. It was only last month that I realized his prediction had come true. Not only had I clocked up a year here, but I’d fallen in love with the place. Alicante may not have the bustling importance of the Madrid capital, the flashy sophistication of tourist-draw Barcelona, or even the bohemian street art which splashes the buildings of its nearest big city, Valencia. But this little place, home to about 330,000 people, offers an unbeatable combination of comfortable city living and relaxed country friendliness. Alicante shows its city side by always offering something to do, whether it’s dressing up for fiestas and concerts or getting fancy at the theatre or a Michelin-starred restaurant. Like Spaniards right across this grand country, Alicantinos know how to party, especially during the famed Bonfires of Saint John (Hogueras de San Juan), a crazy five-day cacophony of noise and dancing. It’s impossible not to enjoy yourself as endless parades snake through the streets, huge fireworks boom across the city twice a day and, on the final night, giant artistic monuments are burnt to the ground around midnight. It’s an extravagant tradition that perfectly illustrates the city’s fun-loving and gregarious personality. At the same time, the people here are small-town friendly, always ready to stop and chat, reflecting the Spain-wide culture that family and friends come first. Too often I’ve found myself abandoning errands, having bumped into a friend on the street and then somehow gravitated to a rowdy tapas bar, filled with loudly chattering locals sipping contentedly at cañas (small glasses of beer). Disconnecting from the city’s hubbub is as easy as a weekend walk among the surrounding mountains or lazy day at one of the many picture-perfect beaches and coves nearby. 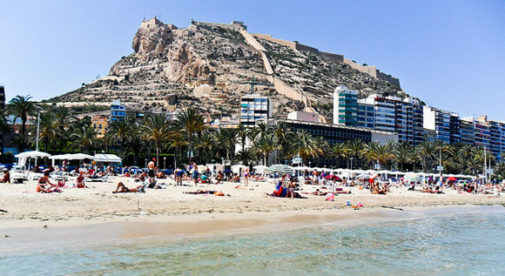 While Alicante has its own little beach, just 15 minutes away by tram is San Juan, a four-and-a-half mile stretch of uninterrupted white sand. They don’t call this area the Costa Blanca (White Coast) for nothing. Whether it’s eating tapas in a restaurant with friends or lounging at the beach…there is always something to do in Alicante, Spain. Like so much of Spain, living here is astonishingly cheap. A decent restaurant meal with a caña can set you back as little as $7, and there’s an abundance of fresh food available at even cheaper prices at the daily central market. 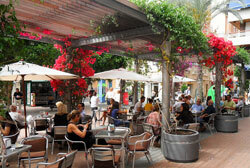 With an international airport and train station offering high-speed connections to Madrid and beyond, I’ve found Alicante a great hub from which to experience Europe. I particularly love that Alicante has two distinct rhythms. In the summer, the city transforms into a sunshine playground for holidaying Spaniards and foreigners from further afield, especially the British, Germans, and Russians. Gelato shops spring up on almost every street, men walk the beaches selling ice-cold cans of beer, and a myriad of languages bubble through the streets. Things slow down as the weather grows colder and the tourists head home. Yet winter here is entirely pleasant as the temperature rarely drops below 50 degrees. Most days the sky remains a crystal clear blue and the wide beaches become yours alone to wander and explore. All of this adds up to that special something my German landlord spoke of, which allows Alicante to get under your skin…until you never want to leave.